This month, Active History is pleased to present a series of posts by Jenny Ellison marking the 35th anniversary of Terry Fox’s Marathon of Hope. A few years ago, I made a visit to Library and Archives Canada to pull files about Terry Fox. In a folder labeled “Terry Fox Marathon of Hope Day” I found forty letters to Prime Minister Pierre Trudeau, Governor General Edward Schreyer and Minister of Sport Gerald Regan about the runner. Written during his lifetime and just after his death in June 1981, the letters were earnest, handwritten documentation of what most of us already know: many Canadians feel an emotional connection to Terry Fox. I am a Terry Fox runner and have been, on and off, since I was a kid. Is there anything more Canadian than the annual fundraising runs for cancer research? Named one of the “greatest Canadians” in CBC’s 2004 TV show of the same name, and again in 2014, Fox is a go-to symbol in conversations about national heroes. But what else is there to say about him? What does studying his life add to our understanding of Canada today and in the past? In spite of my annual runs, I had not given these questions any thought until recently, when I was working with undergraduate students on the subject of heroes and icons of Canada. Students struggled to think about Fox beyond his (considerable) accomplishments and tragic death at the age of 22. At that time there was not very much written about Fox in the academic literature (with the exception of some excellent work on disability that I’ll discuss in another post). In this series of posts I’ll be sharing my findings from the Archives, and making my case for Terry Fox-as-active history. Fox, I argue, helps us to ask important questions about Canada, masculinity and disability. His greatness — and I do think he was exceptional — helps us to think through historical memory and the values that people like to think of as Canadian. But more than that, I want to make the case that Terry Fox was an activist. Terry Fox thought of, planned, and did the initial fundraising and training for his cross-Canada run with the support only of his friends and family. Some discouraged him from doing the run because of the potential risks, and yet he roceeded because of his belief that he could make a difference. Fox was earnest, optimistic, determined and stubborn, and it worked. 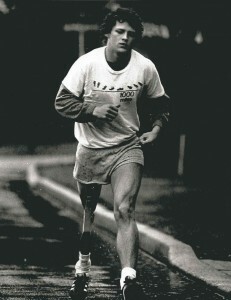 Rather than casting him as “courageous,” we must remember that Terry Fox was a fighter and that he won. On April 12, it will have been 35 years since Fox started his “Marathon of Hope.” While most people are familiar with Terry Fox’s story today, but at the start of the run in St. John’s in 1980, few Canadians knew about Terry Fox. The CBC turned up to film him dipping his leg in the Atlantic Ocean but few others were around. It was a lonely moment. How did it all begin? Fox (1958-1981) was diagnosed with cancer and had his right leg amputated in 1977. A basketball player at Simon Fraser University prior to his illness, he decided while still in the hospital to try to run across Canada. In 1979 he penned a letter to the Canadian Cancer Society (CCS) telling them he believed in miracles, and that he intended to run across Canada. The CCS was non-committal. They told Fox they might help with fundraising if he could get some sponsorship on his own. He wrote to several corporations. A local Ford dealership provided a “Funcraft” van, Imperial Oil donated money for gas, Safeway for food, and another $2,500 was raised selling Labatt’s-donated beer at a fundraiser. In spite of this success, Terry had to hustle for himself in the first month of his run, calling schools and community organizations for support. Some days were lonely and frustrating with limited response. Terry and his friend and driver Doug Alward bickered over who should make lunch and clean their van. Other days the Marathon of Hope received a warm welcome, and Terry was invited into the homes of locals, who held receptions and collected donations. After making their way through Newfoundland and Nova Scotia, Fox and Alward were joined in New Brunswick by a CCS employee, Bill Vigars who began to prepare for a big fundraising push in Ontario. In Quebec the Marathon of Hope was not very popular, and this became a sore point for Terry. By comparison, a marching band greeted Fox in Ontario. In Ottawa he met Prime Minister Trudeau and kicked a ceremonial field goal at a Canadian Football League game; in Toronto the Marathon of Hope raised $100,000 in a single day. 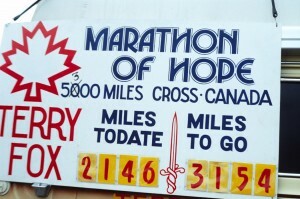 Terry Fox Marathon of Hope banner. City of Toronto Archives. In the midst of his growing fame, Fox’s cancer returned. He had to make several stops for his health, finally ending the run on September 1, 1980. Regular updates on Fox’s health appeared in the press. A telethon on CTV raised an additional $20 million in fall 1980. It didn’t happen as he had planned, but the telethon donations brought Fox very close to his goal of raising $1 for every Canadian (there were 24 million at the time). Fox’s death on June 28, 1981 left many Canadians in mourning. Flags flew at half-mast across the country and his funeral was nationally televised. Parliament adjourned early so that MPs could attend a public service on the Hill. In September 1981 the first annual Terry Fox Runs were held, with about 400,000 participants in Canada and internationally. Since then, numerous schools, a mountain, a stretch of highway and a youth centre have all been named after Fox. Thursday April 2 the Canadian Museum of History launched an exhibition “Terry Fox – Running to the Heart of Canada,” based on 200,000 rarely seen items kept by his family. A companion book by folklorist and CMH curator Dr. Sheldon Posen was released earlier this month. Thirty-five years after the Marathon of Hope, Fox’s life and achievements still resonate with Canadians. Over the next three weeks I’ll take a closer look at some of the lesser-known parts of Terry Fox’s story, and how it can help us to ask critical, emotional and reflective questions about Canada. Editor’s note: we have corrected the spelling of Bill Vigars’ name. Our apologies. Pingback: Terry Fox: A Unifying Influence on Canada?